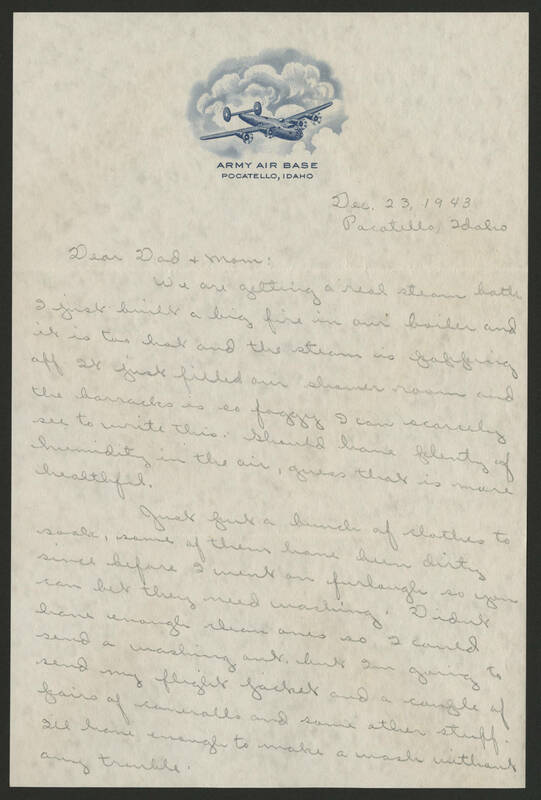 Dec. 23, 1943 Pocatello, Idaho Dear Dad & Mom: We are getting a real steam bath I just built a big fire in our boiler and it is too hot and the steam is popping off. It just filled our shower room and the barracks is so foggy I can scarecely see to write this. Should have plenty of humidity in the air, guess that is more healthful. Just put a bunch of clothes to soak, some of them have been dirty since before I went on furlough so you can bet they need washing. Didnt have enough clean ones so I could send a washing out, but Im going to send my flight jacket and a couple of pairs of overalls and some other stuff. I'll have enough to make a wash without any trouble.